SLAVYANSK, Ukraine -- The tentative Geneva deal to resolve the Ukraine crisis is hanging by a thread after as many as five people were killed in a gun battle near the volatile eastern town of Slavyansk early on Sunday. 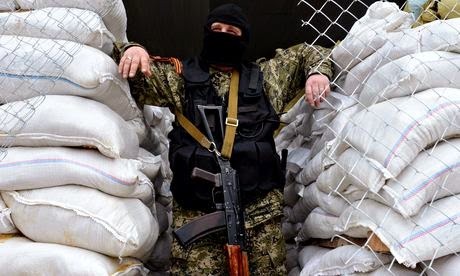 An armed man stands guard at a barricade in Slavyansk, eastern Ukraine. An Easter truce declared by the authorities in Kiev was rudely shattered after two groups opened fire on each other overnight. Three pro-Russian militants were reported killed, along with two of the assailants, whose identity has not been ascertained. A Reuters cameraman reported that he saw the bodies of two local fighters. Slavyansk is one of several towns and cities that have been taken over by pro-Russian units of men, whose allegiance is clear but whose provenance remains a mystery. Under a deal signed in Geneva on Thursday by the EU, Russia, Ukraine and the US, the units were supposed to retire, but they have thus far shown no signs of desisting. A team of mediators is heading to eastern Ukraine to try to persuade the pro-Russian groups to disband, but it appears to be facing an unenviable challenge. Attempts by the Guardian to enter Slavyansk were brusquely repelled by armed men. The situation for non-Russian journalists in eastern Ukraine has become increasingly precarious in recent days. Separatist militiamen near Slavyansk told Reuters that a convoy of four vehicles had approached their checkpoint at about 2am and opened fire. "We had three dead, four wounded," one of the separatist fighters, Vladimir, told Reuters at the checkpoint, where there were two burnt-out jeeps. He said the separatists had returned fire and killed two of the attackers, who he said were members of Right Sector, a group loosely aligned with the government in Kiev. Slavyansk has been controlled by separatists since last weekend. In Kiev, the interior ministry said one person had been killed and three injured in an armed clash. It said police were trying to establish more details of what happened. Overnight, Orthodox leaders in Kiev and Moscow traded barbs over the Ukraine crisis as politics overshadowed traditional Easter observances. Patriarch Filaret thundered to the faithful in pro-western Kiev that Russia was an enemy whose "attack" on Ukraine was doomed to failure because it was evil and contrary to God's will. In Moscow, the patriarch of the Russian church, Kirill, delivered a prayer for Ukraine in which he called on God in turn to put "an end to the designs of those who want to destroy Holy Russia". Kirill said that while Ukraine was "politically" separate, "spiritually and historically" it was at one with Russia, and he prayed that it would benefit from authorities that were "legitimately elected". In comments to be broadcast on US television on Sunday, the Ukrainian prime minister, Arseniy Yatsenyuk, lashed out at the Russian president, Vladimir Putin – whom Kiev and Washington accuse of masterminding the insurgency in Ukraine – for having a "dream to restore the Soviet Union". Yatsenyuk, speaking to NBC's Meet the Press, also condemned those who reportedly handed out pamphlets demanding Jews register or be expelled in the east of Ukraine as "bastards" who should be brought to justice. A poll published on Saturday suggested that the majority of inhabitants in Ukraine's restive east, while suspicious of Kiev's authorities, had no desire to be subsumed into the Russian Federation. The Russian-language Weekly Mirror newspaper said 52.2% of those surveyed for a poll in the separatist hub of Donetsk by Kiev's Institute for International Sociology were against coming under Russian rule, while 27.5% were in favor.